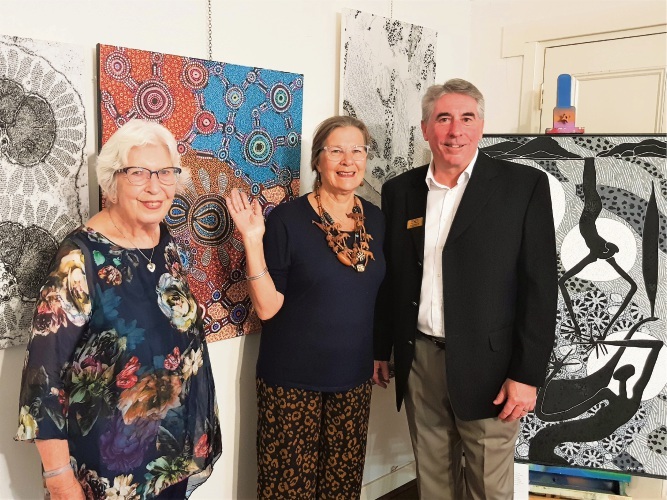 Penny Hoffman, Gayle Bukey and Shire President David Bolt at the exhibition opening. VISITORS to Edenvale Tea Rooms in Pinjarra during April can explore the immersive Stories and Structures – New Connections Art Exhibition that shows the synergies between microscopic elements of the natural world and Aboriginal art. The exhibition demonstrates the connection between culture and science, tradition and modernity and offers a chance to discover the diversity of Australian cultural heritage through the visual medium. Pinjarra is the second WA locality to showcase the display after its state debut in Kalgoorlie. Shire of Murray President David Bolt said the council was proud to have partnered with MZI Resources and the Murray Districts Historical Society to deliver the regionally significant event. The inspiration for the exhibition emerged through the work of Sydney microscopy scientists, who engaged 21 Indigenous artists from various regions across Australia to create artworks that connect with images from electron microscopes. The free exhibition is open daily from 10am to 2pm until Sunday, April 28.